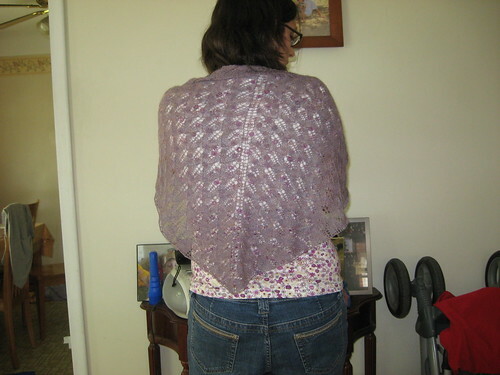 Yarn: Knit Picks Alpaca Cloud in Iris, i used about 1.5 balls so i could have made it a bigger shawl if i wanted but my Omi is petite so i think this will be a good size for her. Notes:This can drag on if you let it but once i got in the flow and memorized the pattern it wasn’t so bad. 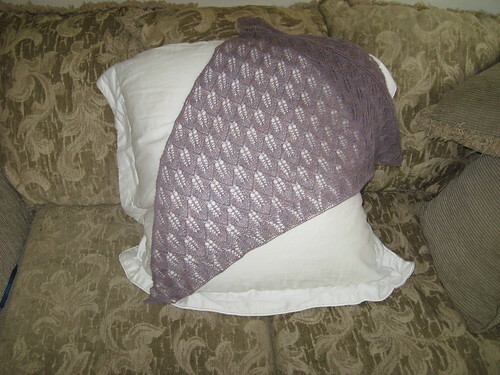 I know some shawls have the scalloped edge-I was not able to achieve that. I even used some of the tips i read about on Ravelry. I used bigger needles on the last row and even bigger to bind off and i bound of Loosely and that still didnt help and i wasnt about to go back and redo it. I came quite close to just throwing it in a corner and thinking Omi will hate this but i blocked it out anyway and in the end i was still pretty happy wit it. The bind off just came out straight and it doesn’t look bad that way at all. 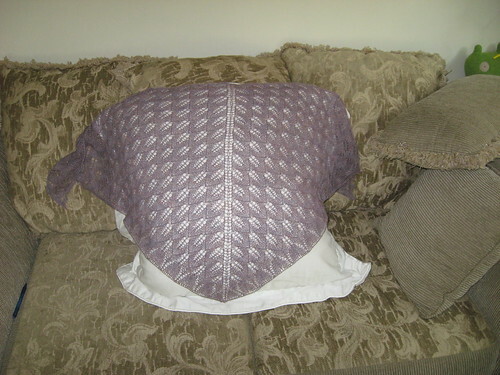 Hubby was really surprised that it was so light when i draped it on him to feel how warm it was. 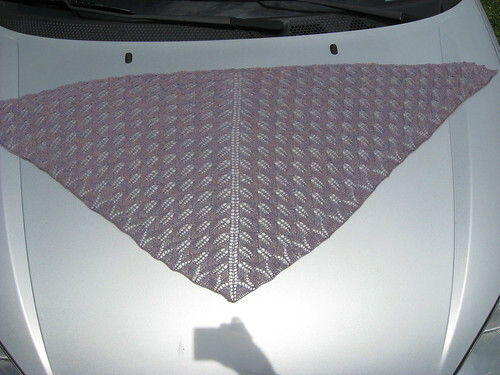 Aside from the unscalloped edge we also had some other drama-i was weaving in my ends and i went to trim the end and accidentally snipped a strand of yarn on the shawl. I almost screamed in horror but instead started to panic that all my hard work would unravel so i found the spot and did a bit of weaving and stringing together so make sure it couldn’t come undone. I hope it worked and even if it isnt fully secure, i did give it a good tug though, i don’t picture Omi being too crazy with it 🙂 Luckily this all happened on the garter stitch border so aside from a little spot that looks a tad bit thicker then everything else you can’t really tell. Next time i will be MUCH more careful and not in such a rush i wanted to hurry and get it ready to mail that that day so that she will get it before her vacation in a couple weeks. She has no clue what she is getting-I love surprises like this. All in all a very easy knit-would have liked a scallopy edge and BE CAREFUL WITH SCISSORS! Sorry to hear about your accident with scissors, I’m glad it wasn’t anywhere in the lace part, it would be more difficult to mend it. Gosh I missed this one too! !